Customer Service - Innovaxin International Ltd.
CSQM - Customer Service Quality Mark is a proprietary customer service certification mark of quality the bearer can claim to have met and surpassed the CSQM Standard. CSQM was setup in 2006 by CSQM International Ltd and in 2011 the company was bought over by Innovaxin International Ltd including trade mark usage and standard certification management. Innovaxin International Ltd is offering the quality mark to companies who meet the standard. 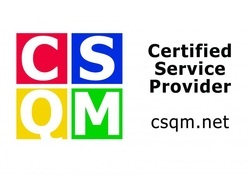 If you are interested in having your business CSQM Certified please contact us at by clicking ﻿here﻿.